Reliable sources of anaerobic digestion costs are hard to find, or non-existent. Finding out about anaerobic digestion costs can be a thankless task. The available information we have found online is invariably only provided as the total capital cost of new AD plants, in a Press Release, when a new plant is opened. A common headline we have seen is: “New Anaerobic Digestion Plant Opens at a Cost of $x million”. The figure is given to impress the readers on how much money has been spent. Little on no information is, in our experience, ever provided about what the quoted cost of the anaerobic digestion plant includes. Nor is there data included on the output power achieved to enable the reader to compute the cost per unit of electricity produced, or biomethane sold. There is no such thing as a standard anaerobic digestion plant for which it is possible to find a quoted cost, and therefore, we cannot provide here the cost per kilowatt hour or specific cost for heat output from a biogas plant, either. They simply vary too greatly in what each AD plant uses as a feedstock and does within the plant in order to produce its products. 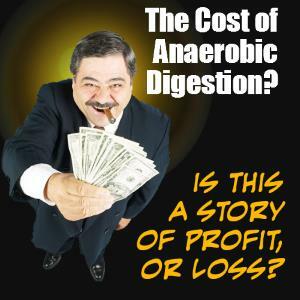 To solve this conundrum, we searched the internet for a way to assess what the costs of anaerobic digestion would be for a particular site/ business and project. in which, doing the calculation would be possible using software they probably already possess. Such a resource for obtaining Anaerobic Digestion Costs exists! It’s also free! Scroll DOWN. Read on, and watch the video below! But if you absolutely must have simplistic anaerobic digestion costs, SCROLL DOWN to the bottom of this page, where we have retained some old prices from several years ago, and also added an example anaerobic digestion pricing table for a farm biogas plant, from the US BIOGAS OPPORTUNITIES ROADMAP PROGRESS REPORT (USDA – EPA – DOE). This page provides “Wet AD Process” costs, except at the bottom (SCROLL DOWN! ), we have some costs for a “Dry” Anaerobic Digestion Plant. The best resource for assessing anaerobic digestion costs which we have found for producing preliminary cost estimates for anaerobic digestion plants is provided by the Washington State University, Centre for Sustaining Agriculture and Natural Resources. The resource consists of a free MS Excel spreadsheet, and to complete the spreadsheet properly we recommend that you watch their webinar, which explains the spreadsheet and how to use it. 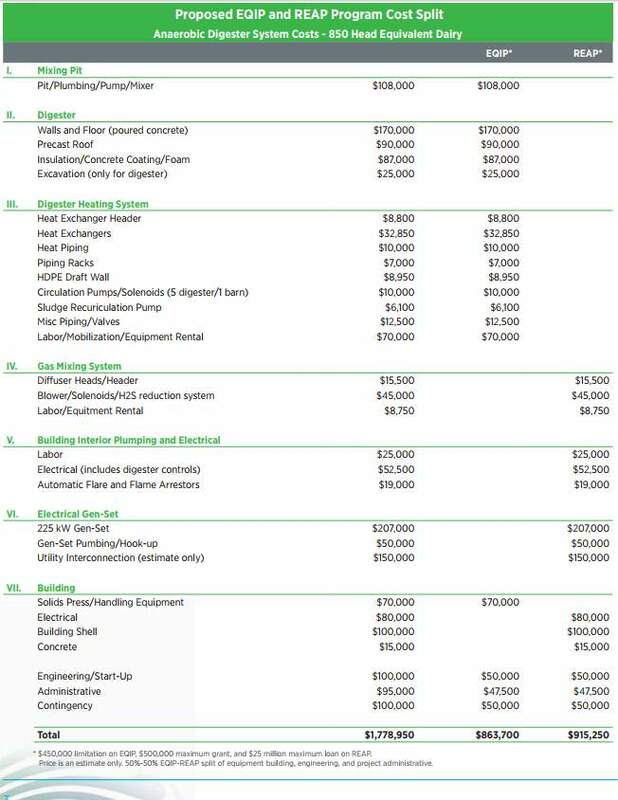 It is called the Anaerobic Digestion System Enterprise Budget Calculator. Download it here. The following is from the US BIOGAS OPPORTUNITIES ROADMAP PROGRESS REPORT (USDA – EPA – DOE) anaerobic digestion plant costs table for a 850 cattle dairy herd. The following table appears to suggest that the costs of power generation using a diesel engine and biomethane upgrading are similar. Read the full report at Davis Edu. The article below this point is a historical snapshot, now out of date, of how things were, before the economic viability of anaerobic digestion on-farm improved dramatically when the Feed-in-Tarif was introduced into the UK, after 2010. It should be noted that the report is dated October 2005 and that since then world oil prices have also risen by 15 to 20% (January 2007), which in itself has transformed the cost of energy so much that for many farmers on-farm biogas production has become very viable economically. Probably the most authoritative recent study on the viability of anaerobic digestion is the report prepared for the Sustainable Agriculture Strategy Division of the United Kingdom Department for Environment Food and Rural Affairs (DEFRA).The report is titled, ‘Assessment of Methane Management and Recovery Options for Livestock Manures and Slurries’ and is available for download from DEFRA’s web site (Report number AEAT/ENV/R/2104). The study’s, authors looked in detail at the economics for options for on-farm AD and centralised AD (CAD) in England, and their conclusions follow:-. All the options proved uneconomic without some extra Government support. However, a small number of larger CAD may be economic, especially if higher levels of industrial waste (up to 20%) were treated in the CAD. A cost benefit analysis based on the options and assuming Government support in the form of capital grants suggests that greenhouse gas emissions equivalent to up to 0.03MtC could be saved annually at a cost of £60/tC, if 20 CAD plants were built. However, this would result in lifetime costs to Government of £143M. On that basis on-farm AD would need significant support to be economic. The authors therefore found that the main challenge to Anaerobic Digestion in the UK is therefore still an economic one. 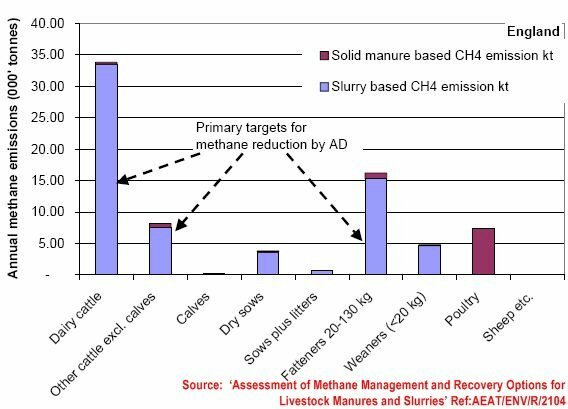 Illustration (above) showns an example of Agricultural Biogas Plants on Dairy Farms and the Annual methane emission from manure management in England. Furthermore, they were of the view that even for CAD (which is more economically viable they say, than on-farm AD, high capital costs and that an uncertain supply chain and market for products gives rise to high levels of project risk. A combination of actions involving financial incentives and engagement with farmers and technology suppliers would be needed to stimulate the market. The experience from Germany suggests the main route to market for on-farm AD is to set incentives at a level such that it becomes a recognised source of extra income for farmers. Their analysis suggested very strongly that this will be an expensive option – for Livestock Manures and Slurries. So, it does have to be considered that the dawn of the significant adoption of AD for Livestock Manures and Slurries is still some way off. Our view at Anaerobic-Digestion.Com is that there is a very good case for additional government investment in on-farm AD. There is a significant win to be found from the reductions in greenhouse gas emissions, and the necessary £143 lifetime costs estimated for the first twenty plants would surely deliver big bonuses in the development of the technology. If done well this investment would act as the seed corn for the mature development of the AD industry at which time costs would surely plummet. Were we not at a similar stage with wind turbines no more than ten years ago? Surely many of us can remember that wind turbine rotor blade failures featured heavily in the news. The doubters were saying that the reliability problems being experienced in that industry at the time were close to insoluble for such highly stressed and massive blades. Yet now who even mentions such problems? The parallels are all around us which show us the benefits of strategic investment and the potential in AD. Let us see some leadership from our politicians who should by now realise that the public demand for action on carbon emissions is high. The public also increasingly want to buy renewable power for their own domestic use, and so the provision of financial incentives for AD plants can help in this and many other ways. I thank you for the article. I am thinking that the most important thing is that biogas should be made from WASTE. It is not good to throw food crops like maize into these digesters. Fantastic. Excellent web site. Plenty of helpful info here. Iâ€™m sending it to a few buddies ans addlitonaily sharing in delicious. And obviously, thank you for your sweat! A cost saving can be had by outsourcing the bulk liquid waste haulage and spreading to a specialist. Complete haulage and spreading serviced offered, efficient and accurate spreading of slurries and digestate. Lagoon mixing service also available. Has anyone used the cost calculator tool at http://www.nnfcc.co.uk/publications/tool-ad-cost-calculator ? It isn’t free, so is it worth the money. I will buy, but want to see a review which is unbiased before I wade in with my plastic card. I would like to tell you that the costs calculator spreadsheet video is not working. The rest is good, and the calculator has a pdf with the instructions, so you may like to update the video. Jeanne – Thanks for your comment. I see that you are correct. The video was not working. I made a few changes to the coding of the webpage to cure the problem with that video. The anaerobic digestion costs video should now be showing up correctly. 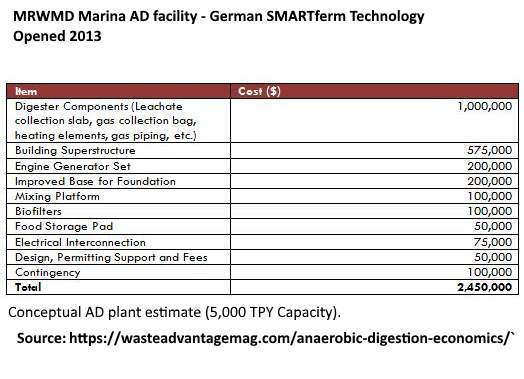 Seeking (anaerobic digestion) anaerobe gärung prices for Deutschland. Who has the price data for Deutschland? We are seeking the possibility to settle the cost of this biogas project we started now. Now we have idea of price. Done now before everything ends up spent! Very in-depth article. But, it supports my view that the costs the web will give you are of questionable reliability, as well as yours. But, keep up the good work – for sure i will check out more posts.